Hello from Austin and the craziness that is SXSW! Greetings from Austin, Texas. 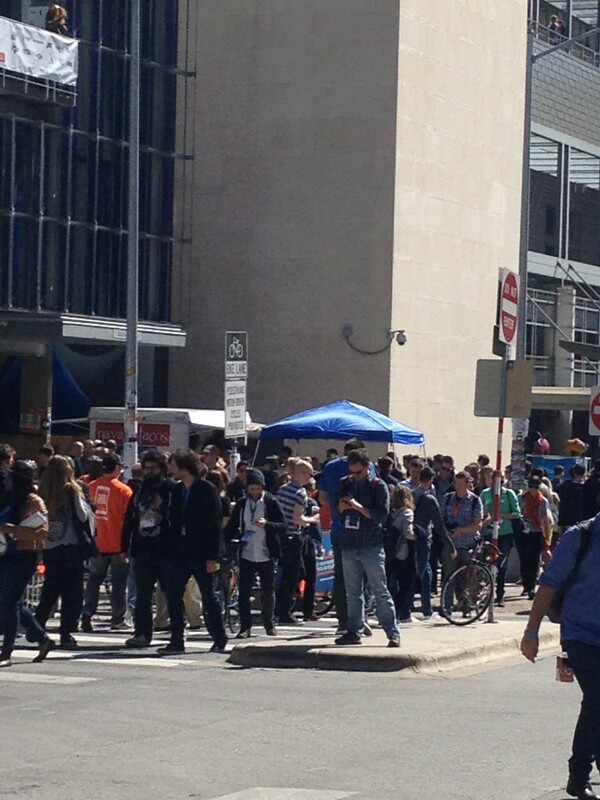 I’m here with thousands of my closest friends to attend the annual South By Southwest music conference. This is year 27 for the event and it’s bigger than ever! 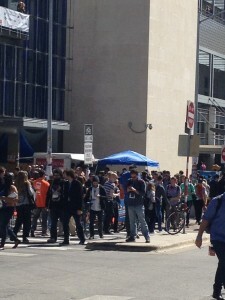 I’ve learned that the easiest way to manage the city during SXSW is on foot. Forget about driving in downtown Austin during the event, there are just too many closed roads and too many people darting about to navigate safely. SXSW Music now runs for five days (one day longer than past years) and when it’s over, 2000 bands (give or take a few dozen) will have performed in hopes of attracting more attention from labels, agents, journalists and others in the music industry. While some of the showcase acts this year are household names (I’m looking at you Jim James of My Morning Jacket, Depeche Mode and (maybe) Prince), many of the performers here are still in the (very) early stages of their careers. For them, SXSW isn’t just the chance to do one showcase set before industry tastemakers, it’s a marathon of appearances. SXSW days are filled with music filled parties that piggyback on the official events and give the truly dedicated a chance to perform three or four shows in a day. Last night, I caught the solo debut of someone I believe we’ll be seeing here for many SXSW’s to come: 13 year old William Harries Graham, a singer-songwriter-guitarist who also plays in a band called The Seaside Swifts. 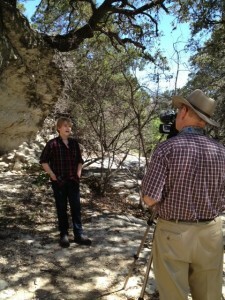 He’s the son of Jon Dee Graham, a true Austin singing, songwriting and guitar-playing legend. William and Jon Dee took to the stage as part of a great “fathers and sons” night at Austin’s famed Saxon Pub. It didn’t matter that the club was a couple of miles from the heart of the SXSW action, it was packed with folks wanting to hear if, in the case of the Graham family, “the apple fell far from the tree.” You’ll be able to see for yourself in just a few days—VOA’s Greg Flakus was on hand to capture the set for a story on William’s SXSW debut. I’ll be posting the video here as soon as it’s produced. Also on that bill last night was another second generation Austin singer-songwriter, Colin Gilmore, up on stage with his father, Jimmie Dale. It was a treat to see the pair perform together–and strengthened my resolve to catch Colin’s solo showcase tonight at midnight. We had a few seconds to catch up after the set and Colin told me he’s been writing a lot of new songs and is close to finishing his next CD. If you haven’t heard him yet, here’s your chance! I would have loved to see Depeche Mode at SXSW! I just streamed their new album on iTunes and it’s amazing! I did not get into that secret show, either! My “secret show batting average” was zero this year. Serves me right, after getting into the Springsteen show last year. I agree with you about the new CD–I’m loving it!